Winter greetings from Michigan! We are getting blasted with a snow storm. My teenage daughter is already planning on not having school tomorrow. Of course, she'll still want me to take her to the mall... Thought I would share with you the tree in the dining room today. 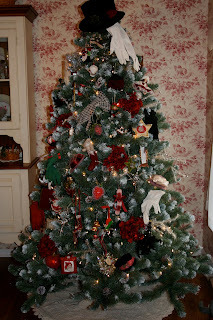 It is decorated with vintage gloves, small fancy hats and various red and black ornaments. The topper is a velvet hat with long gloves coming from it. It looks pretty with the toile wallpaper. I have alot of fun with this room, playing with color and texture. I'm a bit behind with my Christmas shopping. I did just order a pair of pink cowboy boots for my 2 yr. old niece, so much fun! How is your shopping coming along? My Christmas preparations are inching their way along. Last year, my husband had the wonderfully wise idea of decorating using a "Twelve Days of Christmas" philosophy. We packed each room's decoration into their own boxes, marked each one with a description and a number. This year, I started with number 1 and began decorating with one box each day for twelve days. I started early so I could skip days when my energy level was low, and so far, it has worked out well. Next year, I might add "to-do's" also, like baking cookies or making hard-tack candy. As far presents? I try to keep it to a minimum. We generally give baked goods to our neighbors who give baked goods to us, and then donate to charities in our relatives' names. I love the "Twelve Days of Christmas" idea! I haven't even gotten to thinking about baking yet, thanks for the reminder. You sound like you've got it all under control. I'm jealous!